Well, another week has flown by. Have you ever noticed that the days so often seem to crawl, but then the months and years fly by? How does that work?? I’ve been sick this whole week (I think I got sick at the EXPO last weekend) and the hours have passed sooo slowly…but all of a sudden, it’s Friday! Dr. Cho rescheduled our dinner from last week. He called me and said “we will eat dinner together on Tuesday night.” I wasn’t really given an option, lol, and so dinner was duly eaten with him on Tuesday night. I was glad that no more last-minute teacher’s dinners were scheduled; canceling twice in less than a week would have been really awkward :(. But ya, he took myself, and Anthony (another English teacher; he leads worship at church), and the pastor and his whole family (4 kids under the age of 5!!) out to dinner at a really ritzy upscale restaurant. The Mundys came a little later than we did, so Dr. Cho and Anthony and I went for a walk around the lagoon that borders the restaurant. The water was sparkling, there were swan boats floating gently on the lake, and the sunset was breathtaking. I was kicking myself that I had forgotten my camera :(. At dinner the kids were a little loud and distracting at times, but the food was wonderful, and the company excellent, and overall I had a lovely time. Wednesday night I went on an excursion with Elizabeth to Pohang, about 30 minutes away by bus. After going to Pohang a few weeks ago, I felt like an old hand at the buses here, lol :). 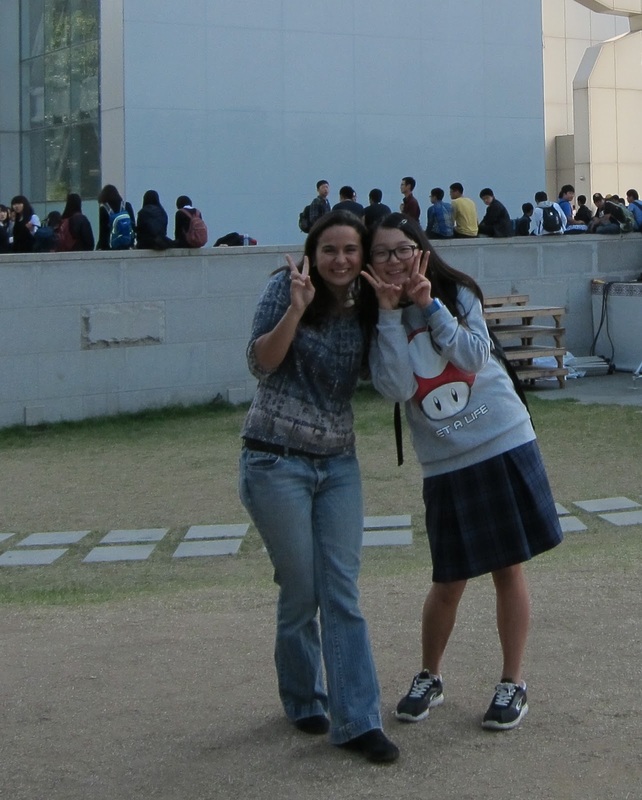 So I was able to show her the ropes, and we spent the afternoon in Pohang. Chuseok, the Korean version of Thanksgiving, is coming up this weekend, and it’s a common gift-giving holiday. So we went to find gifts for our host families and co-teachers. It was so hard!! I love giving gifts, but it’s really hard to give a thoughtful gift when you don’t know the person to whom you’re giving the gift!! But anyway, we found some small gifts – I settled on nuts all-around – and headed back to Gyeongju. But it was worth it – I gave my presents on Thursday, and then on Friday I was showered by a flood of little gifts from my co-teachers. I felt so loved :). I came back from Pohang and found my host sister, Areum, in the middle of a mess in the kitchen. She was trying to make fortune cookies, but had no clue what to do – had never even used their oven before! She looked at me and was like, “Lauren…help me!” So of course, I did, and we made homemade fortune cookies for the rest of the night. It was fun :). Thursday was an adventure, for sure. The owner of my school, Dr. Choi, decided that he wanted to take Elizabeth and myself out for lunch. It was really nice – he took us to a traditional Korean restaurant, and we had a huge spread of dishes, and it really was a lovely meal. But it also made me 15 minutes late for my class when I got back. Instead of letting the sub just teach the entire class, I rushed up as soon as I got back and finished the last 30 minutes. It made the class a little stressful, because I hadn’t really had time to prepare, but I’m glad I did it. I love my girls, I want to spend as much time teaching them as I can :). It sure boosted my ego, too, when I showed up to class….they gave me a standing ovation. This is why I love teaching… <3 🙂 Then Thursday night was salsa night! I dragged Anthony along with me to go dancing – he told me that “he loves to dance and knows how to move his hips, but not much more than that ^_^.” Well, that was enough for me, and so Thursday night found us rendezvousing on our bikes to head to the dance together. We left early and went to a little Russian restaurant – the same one, in fact, that I went to on my very first excursion on my own into Gyeongju. We were early to the dance, so we just walked around for a bit. He showed me some popular places, helped me connect some of the dots between the places that I know and their relation to each other, told me stories about the city. It was fun. At the dance, I was impressed with how quickly he picked things up. I wish I had known more moves to teach him, because he is a fast learner. But one of the Koreans there kind of made us his special project throughout the night, so I think Anthony was still able to learn quite a bit. The club we went to seems to have several line dances that they do every night. He picked them up almost instantly, while I was left fumbling along in the dust, lol. But it was still fun. Dances are always better when you have a friend to share the joy with :). Oh, 2 more big events happened Thursday night! First, I got my first proposition from a Korean man. One of the guys at the dance knew a little English, so he was asking me about myself. “How old are you?” he asked. “I’m 21,” I said. “Oh, wow, I’m 37. Do you want a Korean boyfriend? Koreans are alot of fun. What’s your phone number?” Don’t worry, I didn’t give him my number, but I found it rather amusing, nonetheless. The other event was a little disconcerting. As Anthony and I were heading home, a man crashed on his bike right near us, in the middle of the road. We ran over and picked up his bike for him, but he wasn’t moving. He just lay there in the middle of the road. I couldn’t tell if he was drunk or perhaps mentally disabled. But he didn’t really seem to want us to help him. So after hanging around for a few minutes, we pulled his bike out of the road, said a prayer for him, and continued on our way. I’m still not sure if we did the right thing. I just didn’t know what to do…it was very disconcerting :(. So that’s my life right now! It’s starting to become the normal routine…but when I really look at it, there’s nothing normal about this life! You know that you’re living a rather unique life when ritzy meals, homemade fortunes, random propositions and old men sitting in the street has become the norm :). 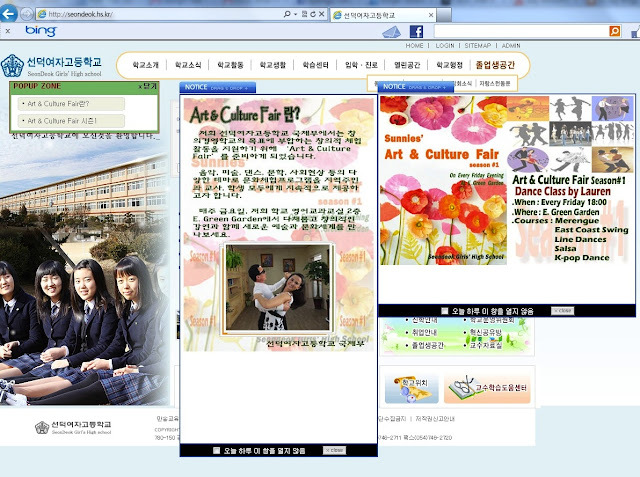 Well, I found the Korean classes. And the salsa club. And the frisbee game. But let’s start at the beginning…. Thursday night I set out armed with a picture of a hand-drawn map to guide me to the Korean lessons. It was almost good enough. I made it to the intersection that the building was on, but the building itself was tucked away and rather hidden, so in the end. I had to call the girl who had given me the directions to help me. But I got there, that’s what matters, right?? 🙂 The classes are taught by a Korean, as kind of a language exchange thing – she teaches us Korean every week, we take turns teaching her English every week. The classes are super basic – way beyond my ability, and that’s saying something, lol – but I think I’m going to keep going, anyway. It’s always helpful to have someone I can ask questions of, and plus I want to make a Korean friend. Plus it’s something to do to get out of the house….. So right after class, I headed over to the dance. I did not even have a hand-drawn map to help me find this one, and I never would have stumbled on it if one of the other girls in class, Martene, hadn’t gone before and offered to show me where it was. Through a shady alley, up two flights of windy stairs, around a few corners, and behind a tiny doorway….we found it. But boy, once I got there, I SOOO did not want to go in. I didn’t realize how intimidating it would be until I was standing in the doorway. But by then, it was too late. They had spotted me and were waving me in. For all of the crazy or adventurous things I’ve done in my life….I’d have to say that stepping into that roomful of Koreans had to be one of the bravest things I’ve ever done. Saturday had some crazy weather going on in Gyeongju. There was a big storm or something on the coast, and so we had gusting winds and pelting rain all day. In the middle of it, I decided to go on a bike ride. Riding against the wind and rain – and then playing 3 hours of Frisbee – left me exhausted by the end of the day. By the time I made it home, it was dinnertime, and there was apparently a mini family-reunion of sorts planned at my house. So I got to meet all of my Korean cousins and aunts and uncles, and then after they left my host sister insisted on a Spanish tutorial lesson…by the time I finally slipped into bed, I was falling asleep on my feet. But it was a good tired, a day well-spent. Sunday I went to church again. Brought a few new friends with me. After I got home, my host family took me to the International Expo. It’s a huge cultural fair / expo thingy that tours around Korea – it only makes it to Gyeongju once every three years. There were lots of music performances, dances, plays, a food court, traditional artwork, kiddy crafts, the whole shebang…it was a blast :). Well, tomorrow’s another school day. I’ve gotta go work on my lesson plans for this week. The Lord is good. I love you all!!! My cousin making her mask…. Well, another week is almost over. I can’t wait until school settles down and I have some semblance of a schedule. With the renovation of the new English building, I never know what’s going to happen or what’s going on. Yesterday the computer in 2 of my classes just decided to stop working (I had checked it the day before and verified that it was working properly! ), so I had to improve – again. Can anyone say tongue twisters?? 🙂 Five of my regular classes were canceled, but I gained 3 different classes that I’m having to sub for. I was told that I can do “anything” with them….which is almost worse. What do you teach to a class when you have no idea of their levels, and you will never teach them again?? So ya, I’m looking forward to settling down a little bit, both at school and outside of it. I think I’m finally experiencing this thing that everyone warned me about called “culture shock.” I didn’t have any problems adjusting in Spain and, although I did in Costa Rica, that only lasted a few weeks. It was nothing like this. The constant, never ending struggle to adapt and understand is merciless. All of the little things you have to remember – wear slippers to school, brush your teeth after classes, put your chopsticks over your bowl when you’re finished, bow to teachers, don’t bow to students, take your shoes off when you’re inside, 90 degree bows to principles, 45 degree bows to fellow teachers, turn off the hot water when you’re done showering, give and accept things with 2 hands….the list goes on and on and on. And always working so hard to understand what people are saying leaves my brain a mushy, sticky, unhappy mess by the end of the day. I’m told that the 3-month mark is usually the worst, and then it gets better. I surely do hope so, because the thought of it getting worse than this – or being this bad the entire time I’m here – makes me want to curl up in a corner and never come out. Alright, I’m done, sorry for the pity party. But ya, this week has been more or less adventure-less. Except on Tuesday. A new friend of mine, Harry, asked if I wanted to go hiking with him, so I left after school and we took a taxi to the base of the mountain. Except we misjudged how far away the mountain was, and I had to make it home for dinner, so by the time we got there it was already so late that we had to turn around and start walking back :(. But it was ok….instead of an intense hike, we had more of a leisurely stroll, and also got to visit some great historic sites that we walked past on our way back into town. I’ve done a lot of scouting this week, and I think I’ve found Korean classes and a salsa place on Thursdays, and Ultimate frisbee games on Saturdays. I’m going to try to check them out this week. There’s a teacher’s soccer club at my school, but I’m not allowed to play since I’m a girl….lame :(. Also, a deacon at my little church invited me to have dinner with him on Friday, so that should be fun. Apparently he does this for every new foreigner in town – has them over for dinner, gives them rides, takes them hiking, etc. Seems like a wonderful man. Still no swing dancing, but I found someone who apparently used to dance in the Atlanta circuit (small world!! ), and she said there’s some swing in nearby towns, so I’m hoping I can convince her to come with me sometime. That’s next week’s project, though….it’s too overwhelming to do this week. I know some of you are dying to see my school and the people I work with, so I’ve included a few pictures in this blog. All of my classes were canceled today, so I had time to walk around and take some pictures :). Also, in case any of you are ever feeling bored or just in the mood to send something to a homesick American living on the other side of the world, my mailing address is below. Love you all!! These are the normal classroom halls…. There’s also a pond at the end of the path. It’s my favorite place on campus :).